We are talking, of course, of sourdough. To make sourdough you either buy or create a ‘mother’, also known as ‘chef’ or ‘starter’. This is a basic flour and water mixture, which is fermented, that you ‘feed’ continually so that it remains active and potent. 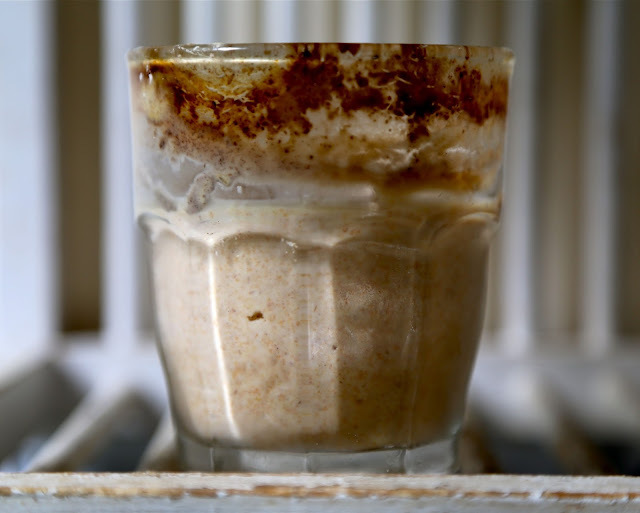 With a sourdough mother, you do not need to use commercial yeast, either fresh or dried. is lower GI than industrially produced bread, meaning that you digest it slowly. This is useful in terms of combating the diabetes 2 epidemic. It would be disingenuous however to pretend that is easy. It isn’t. I’ve been making sourdough regularly for six months now. I don’t bake a loaf every day so it’s been difficult to keep my sourdough mother is good health. I went away for five weeks in May and kept my sourdough mother in the fridge. When I returned I fed it up, with a mix of flour and water and it seemed to gurgle back into life. Then in the July heatwave, I left my sourdough mother on the kitchen counter for several days, without feeding it. Since then, it seemed moribund. Normally when I feed it, it bubbles up and over the top of the jar. But it stopped doing that. It also started to smell alcoholic, grow a bit of mould and a dark liquid on top. Was it dead? Had I killed my mother through neglect? The Real Bread campaign has named this month Sourdough September. So this weekend I attended a sourdough clinic by baker and author Emmanuel Hadjiandreou who wrote the award winning baking book “How to make bread’(Ryland, Peters and Small), beautifully photographed by Steve Painter. It took place at The Baking Lab, in an unprepossessing council property from the outside but a ‘bijou’ light and airy baking space for a cooking school within. I’ve been there before to learn more about bagels and pretzels with Maria Mayerhofer, a Danish baking teacher. So I carried my neglected furry jar of Kilburn sourdough, through the rain, to be healed. As soon as I arrived, Emmanuel, who looks like a combination of Harry Potter and Popeye, round eye glasses and bakers’ biceps, beckoned us over. He sniffed at my jar and held it up to the light. He then stuck his finger into the mixture and tasted it, wincing. Examination over, he diagnosed neglect but declared the patient not dead. “That’s still alive!” he pronounced in his stringent South African accent. 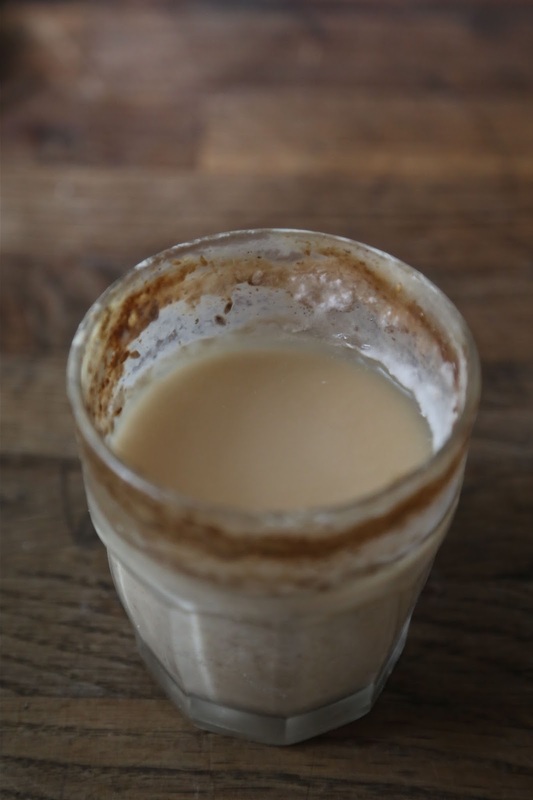 So, after consultation, I have compiled a list of sourdough ailments and the remedies. Problem: dark liquid at the top of your sourdough mother. This is not actually bad stuff, in fact it protects the mother. It’s called ‘hooch’. Cure: Drain off the liquid. Feed. 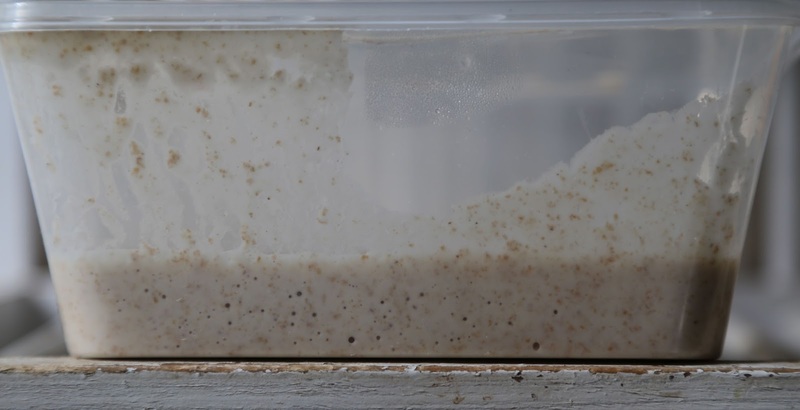 Preventative measure: If there is clear or dark liquid at the top of your sourdough mother, that means it’s hungry and wants to be fed. Problem: mould around the rim. Cure: transfer it to another clean jar. 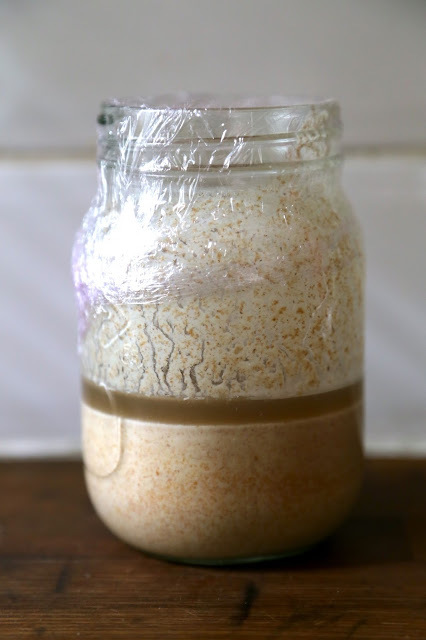 Preventative measure: if you are not feeding your sourdough every day then keep it, well sealed, in the fridge. Feed the fridge mother, two or three times a week ideally. Sourdough is comprised of two acids: acetic and lactic. Acetic is the vinegary smell and taste. Lactic is a cheesy smell. Healthy sourdough can smell like silage. Wheat is, after all, a grass. Problem: it doesn’t bubble up when fed. Diagnosis: does it still have some bubbles? This is why it’s good to have your mother in a clear container, so you can hold it up and look all around it. If there are still some air bubbles, there is hope. Cure: feed it if there are bubbles. Problem: black with thick layer of mould. Cure: Scape it off carefully, trying not to disturb the underneath, and discard the mould. Feed. This is revivable if it has bubbles. If no bubbles, erm, sorry but it’s dead and you will have to start again. However it’s actually rather difficult to totally kill a sourdough mother. Bread is the safest product because you bake it at high temperatures. You can even use the dark liquid to make vinegar. Diagnosis: the bad bacteria have taken over. Cure: Chuck it and start again. You could take 7 to 10 days to feed it up again but the bad bacteria might come back. Add 50g of wholemeal, rye or strong white flour. Rye is best really, it really gives flavour. If it’s not bubbling do this again. Once it bubbles, make bread. Get a scale, weigh out 100ml of the sourdough. Chuck the rest. Mix. Leave for 24 hours. Put it in the fridge, covered with cling film. Feed once a week/fortnight/month. I do it once a month, it’s still ok.
“You never cook bread, you bake it”. Baking is in the oven, cooking is on top. You can freeze your mother in 75g increments. Bakers always take home a little of their sourdough after a days work in case the other bakers sabotage their mother. *in the recent debate about austerity food bloggers v Jamie Oliver’s recent book ‘Save with Jamie’, writer Alex Andreou noted that cheap bread doesn’t go stale, it goes mouldy. For what to do with your stale sourdough, go to this post, a recipe for Panzanella salad or bread salad, it’s delicious. Excellent – thank you so much – this information is invaluable. This is a most timely post. I've just baked my first sourdough loaf made from my very young mother. Now I know how to deal with any future problems. Thank you! Some handy tips here. I have had mine going since April this year, I keep her (Mrs Boswell) in a large Kilner spring clip jar in the fridge and bake from it every other day. We can't eat any other type of bread now. Haha! 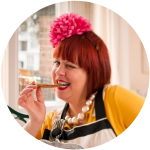 I've noticed there are no supper clubs on your restaurant bucket list? Hi Kerstin! So glad I discovered you ;)I also work with the book written by Emmanuel Hadjiandreou(hoe bak ik brood, in dutch)and recently |I started to make a sour dough starter(mother). My question is: do you have to keep the pot on roomtemperature, as my mother doesn't do anything after 3 days. I use white flour.Thank you for answering!